We are back with our 24th instalment of Bizarre Beyond Belief Magazine, which includes image features from Jeff Mancilla, BIP, Sasha Blot, Sabek and interviews with Ernest Doty, Dee Skulls, MEDIAH, SHOK and Mear One. Click on the image or link HERE to read for free. Mural artist Sabek recently finished brilliant new piece in Malaysia entitled “The Bond”. 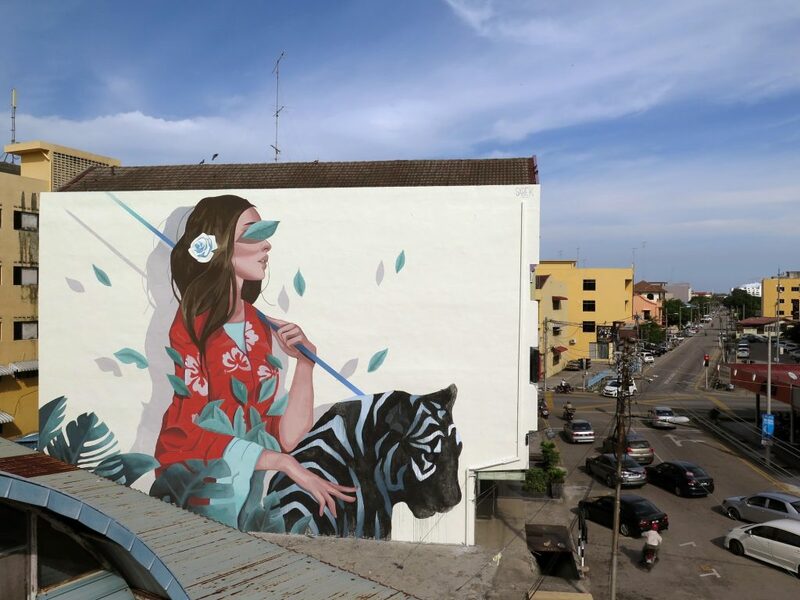 The new figure based piece on streets of Muar features a woman sitting on a black tiger and reflects the idea that the human race relies on nature and vice versa. As previously posted, a number of big street artist have been out and about in Malaysia for the Urban Xchange festival and today’s update is with Sabek. Using his signature graphic style, Sabek crushes a couple of new beautiful murals on the streets of Penang.